Are you looking for a team building outing or group adventure in Phoenix or Scottsdale that your group will never forget? You’ve come to the right place! You can dive into highly effective and absolutely thrilling options with the Team Building and Team Bonding Adventures from Desert Wolf. We built our company on “entertaining” Scottsdale tourists by giving them unforgettably awesome adventures, which is no small feat in the highly competitive Scottsdale tourist market. We had to do something to stand far above the rest – and we did. Desert Wolf has been ranked the No. 1 off-road adventure company in Scottsdale since 2009, with more than 18 industry awards to our credit. We’ve even been ranked No. 1 in Arizona, Nationally and Internationally. So, what does that mean to you? You get the same Desert Wolf passion for entertainment, adventure and excellence with your Team Building as tourists get with their tours. But yours comes with added benefits from being specifically designed to help produce stronger and more powerful teams. You also get four different options from which to choose. Join hundreds of corporations including Google, GE, Shell Oil, PetSmart, Delta Air Lines, GoDaddy, Wells Fargo, General Motors, American Airlines, P.F. Chang’s, Fosters, Bayer, GES Expo Services, Emerson Electric, Nike, Hewlett Packard, Boeing, Anheuser-Busch, National Bank of Canada and many other small, medium and large companies that have enjoyed our group adventure. Desert Wolf Tours specializes in Group Adventures. Whether you just want to take your group on our awesome Off-Road Desert ATV Tour, or you want something really special like our ATV Tour & Machine Gun Adventure, Ultimate Team Building Challenge or the XTREME TEAMS Elite Combat Simulator, our Group Adventures Team has you covered. Group rates start at just 12 people and we can accommodate a group of up to 250 people. Watch the video below to see the various team building options we offer … allowing you to achieve your team building goals. Group adventures in our Tomcar ATVs are awesome! When teams spend time together sharing experiences, they bond more closely and, in turn, work better together. Here are highlights of your trip:This Team Bonding Experience takes you deep into the Sonoran Desert where you may see javalinas, desert mule deer, wild burros, coyotes, rattlesnakes, scorpions and other indigenous creatures. 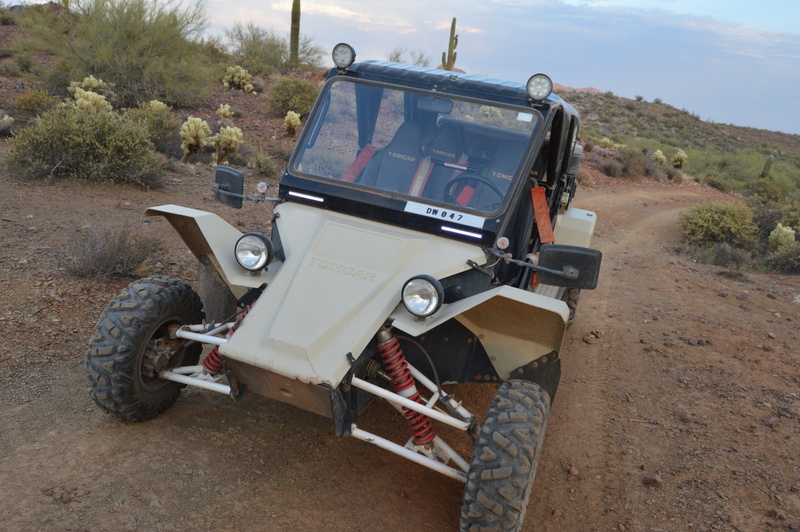 We will lead you on a guided Adventure as you drive an AMAZING TOMCAR. Experience our tour that is: Ranked the #1 Tour and Activity on TripAdvisor, voted BEST Guided ATV Tour in Arizona by BestThingsAZ.com, voted the BEST OFF-PROPERTY EXCURSION IN THE WORLD by TravelGolf.com, and FEATURED on The Golf Channel! Drive an authentic, military grade TOMCAR ATV (must be 18 years or older to drive, younger passengers are welcome). Go deep into the Sonoran desert where few people ever go. Travel through rugged and beautiful terrain and see amazing views. Be entertained by the Valley’s BEST guides as they present interesting facts, trivia and survival tips about our incredible desert. Receive a Desert Wolf Neck Buff (you’ve all seen them on the hit TV show, Survivor) absolutely FREE with each paid seat – that’s a $20 value. Meeting Location: Roadrunner Restaurant, New River; 47801 N Black Canyon Hwy, New River, AZ 85087. Transportation can be provided for an additional fee for groups. Please call for more info. Price: $175 per adult (age 12 and up), $109 per child (11 and under). Group discounts available for groups of 12 or more! Standard booking at 4 people per vehicle. Option of 2 per vehicle, call for details. Number of Guests: Minimum of 2 guests. Call for maximum group size. Teams bond even better when adrenaline is pumping, and that is what you’ll get with our Level 2 Adventures. Top Guns Adventures – Add-on for Tomcars! A corporate group having an amazing experience on our Top Guns shooting adventure! Price with Tomcar: $324 per adult (age 12 and up), $258 per child (11 and under). Group discounts available for groups of 12 or more! Standard booking at 4 people per vehicle. Option of 2 per vehicle, call for details. Number of Guests: Minimum of 8 guests. $400 Private Adventure Upgrade required, waived at 24 or more guests. Call for maximum group size. Machine Gun Adventure – Add-on for Tomcars! Machine Gun Adventure **MOST POPULAR** – This AWESOME Adventure combines the best of both Worlds. You’ll get the same great Tomcar ATV Tour that you love … with an EXCITING twist. Your group will stop at our desert shooting range where your Guides/Instructors will set up our MACHINE GUNS and give you a thrill of a lifetime! This Adventure offers your group the once-in-a-lifetime opportunity to shoot fully automatic machine guns in the heart of the beautiful Sonoran Desert! Your group will get to shoot an M1919 Browning Belt-Fed .308 Machine Gun; an AK-47 Machine Gun and an M4 Machine Gun! When the firearms portion is completed, you will jump back in the Tomcars and continue on your Tomcar ATV Tour! Duration: Approximately 4 hours, depending on group size. Price with Tomcar: $324 per person. Group discounts available for groups of 12 or more! Standard booking at 4 people per vehicle. Option of 2 per vehicle, call for details. Number of Guests: Minimum of 8 guests for this to be a PRIVATE tour. [If you do not with for this to be a private tour for your group, you can just book your group our regular ATV Tour and Machine Gun Adventure that can be found by clicking HERE.] $400 Private Adventure Upgrade required, waived at 24 or more guests. Call for maximum group size. MINIMUM AGE FOR SHOOTERS IS 13. Cheering, high-fives and loads of real-life teamwork is what you’ll get with our Level 3 Adventure! 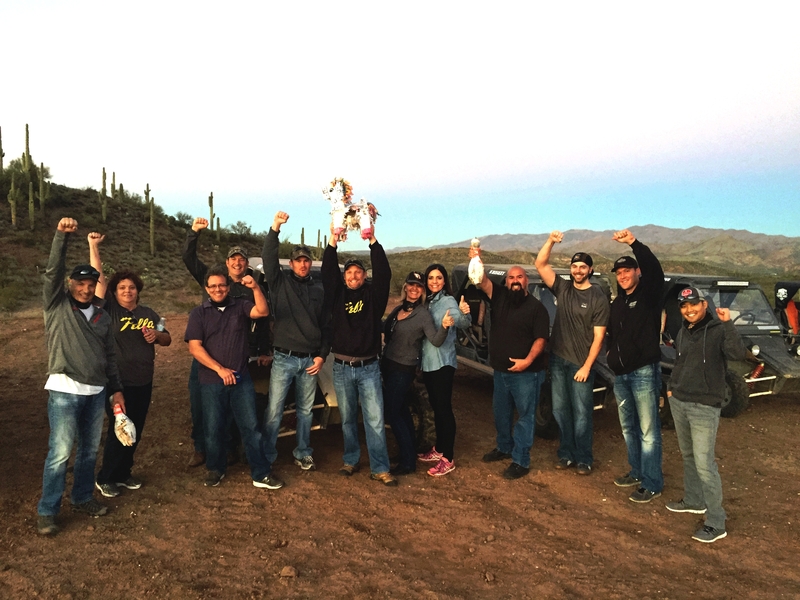 This challenge encompasses the amazing Tomcar ATVs to get your group out into the Sonoran Desert to complete a series of team challenges. Compete head-to-head in a tomahawk throw, play “Wild West” while shooting cans off of a rail, test your accuracy with a football challenge, and see how close you can get while tossing horse shoes! This is the ultimate, off-road team building adventure! Challenges can be customized for your team! Duration: Approximately 3 to 5 hours, depending on group size. Number of Guests: 8 or more. Click Here to play ULTIMATE TEAM BUILDING CHALLENGE video. 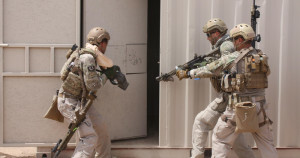 Can you imagine the kind of performance you’d get out of your business team members if they were trained in the same way Elite Special Operations Teams are trained by the U.S. Armed Forces? Now, you can find out! The Ultimate Team Building Experience! A team breaching the shoot house in our Elite Combat Simulator team building event. Desert Wolf Tours, which has been taking guests on a variety of 5 Star excursions and adventures in the Sonora Desert since 2006, now features an innovative style of corporate team building: an Elite Combat Simulator, where co-workers receive realistic Special Operations training developed by the U.S. Armed Forces. Participants are provided with fatigues, Special Forces-style equipment and modified non-lethal firearms with simulated ammunition. Water, snacks and a box lunch are also provided. Click here to read the recent article that ettractions.com wrote about our Xtreme Teams Training Simulator! Team members first receive realistic military-style training such as weapons tactics, then they’re asked to plan and complete three exciting combat missions based on real-world military operations, including the hunt for Osama Bin Laden. If a group wants the ultimate “immersion experience”, the action and intensity of the Elite Combat Simulator can be further enhanced by controlled fireworks that simulate RPGs and IEDs. Successfully completing the training and the missions requires collaboration, communication, strategy, stress management, trust, and accountability, all useful skills designed to make team members work more closely and more effectively – plus have plenty of fun in the process. These intense but safe activities can be beneficial for IT groups, sales teams, or similar employee groups that will benefit from working more cohesively to improve their overall performance. Completing the missions in the eight-hour timeline can effectively transform any team into an XTREME TEAM, and the quality and intensity of missions go way beyond paintball or combat video games. A group of women Executives who just completed the ECS Leadership Training Adventure. The required collaboration can also be an especially useful opportunity for Executive Team Building that goes far beyond common corporate leadership training programs that typically take place in boardrooms or off-site retreat centers. Groups can be as small as 6 or as large as 24. No previous military or firearms experience is required. Meeting Location: Tonopah, AZ 85354 (About 1 hour west of Phoenix.) Transportation can be provided for an additional fee. Please call for more info. Number of Guests: Minimum of 6 participants. Maximum group size is 24. WATER, A BOX LUNCH AND SNACKS ARE PROVIDED. For more information, CLICK HERE to go to Team Building website. “[…] They listened to what we wanted and made lots of good suggestions to help make our event the best it could be. Their customer service was unbeatable all the way around. Want Breakfast, Lunch, Dinner, Open Bar or even a Live Band before or after your tour? The Desert Wolf Team can make it happen for you. The RoadRunner Restaurant and Saloon is on-site and can handle your group from 10 to 500+ people. This is no cookie cutter tourist trap. This is a true locals place in authentic Arizona style. As one example of what we can do, we brought in Celebrity Chef, Beau MacMillan as a private chef for one Corporate event. So, the possibilities are only limited by your imagination and budget. The Roadrunner boasts a large, rustic outdoor entertaining space with plenty of room! Prime dates book up fast. So, email [email protected] or call Hunter Corbier at 877-613-WOLF (9653) today to schedule your Team Building or Group Adventure. You and your team will be glad you did.